"The need for the product divided by the price equals the sanity of the society". The Armani universe consists of Clothes, perfumes, glasses, watches, hotels, funiture, flowers and even chocolate. Not to mention all the collaborations that extend the brand. 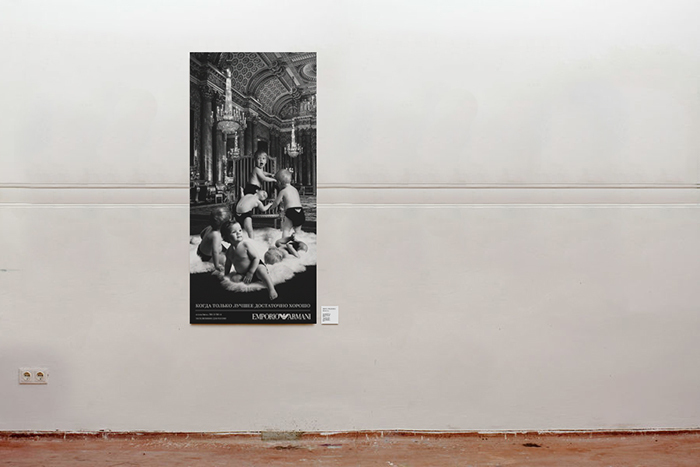 ​Armani Diapers In this artwork Petro explores consumerism. When brand are expanding their offerings this emphasis what brands really offer.Not products but context and comfort. This development is accelerating and brands are becoming liquid. The fashion industry is pushing this development, using their brand to add value to products as diversified as mobile phones, flowers, furniture, watches, cars, hotels and kitchen tools. Consumption as a way to define end express peoples identity. When brands are becoming bigger and more important could every product in the end be designed to enhance your identity. Advertising is building the brands in this direction, when consuming, every choice should tell, if not others, yourself who you are. Smart, premium, responsible or any other standardised category of consumers. Consumtion is one of the most important markers for personal expression. Petro was interested in how far a brand could expand it's offering. The question was if people would react at all if a well known luxury brand started to sell $30 diapers. In order to find out Petro decided to fast forward this development. 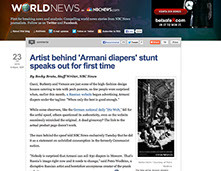 The story invented was that Armani Russia got the go to start selling very expensive diapers to the russian nouveau riche.A fake website was produced, it looked exactly as the Armani Russia website. 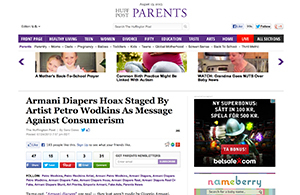 Petro produced a picture with babies in home made Armani Diapers. 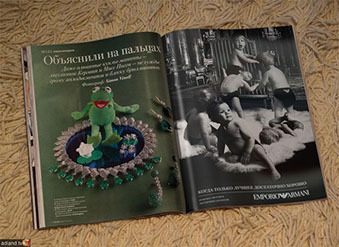 The picture was transformed into ads, both on the website and placed in russian fashion magazines. After 4 weeks the diapers was revealed as an artwork. The Artwork was featured in media all over the world and it raised a lot of questions on consumerism.